Pension plan administrators do it. Their actuaries and consultants do it. Professional endowment and foundation investors do it. Financial advisors do it. Private investors may or may not do it, but they probably should. All of these folks already are or should be asking themselves the following question: What’s a reasonable expectation for the long-term return on a broad-market equity investment? Professionals usually answer the question using complex models, and there’s nothing wrong with that, but we’ll keep it simple here. Simple often beats the snot out of a long white paper, and two recent developments beg for simple. You’ll decide for yourself, of course, how to interpret the chart, but we’ll entertain three possibilities. First, you might rely on a few instances in which S&P 500 returns reached almost 4% after the equity allocation was 25% or more. Compared to today’s miniscule bond yields, 4% looks respectable. 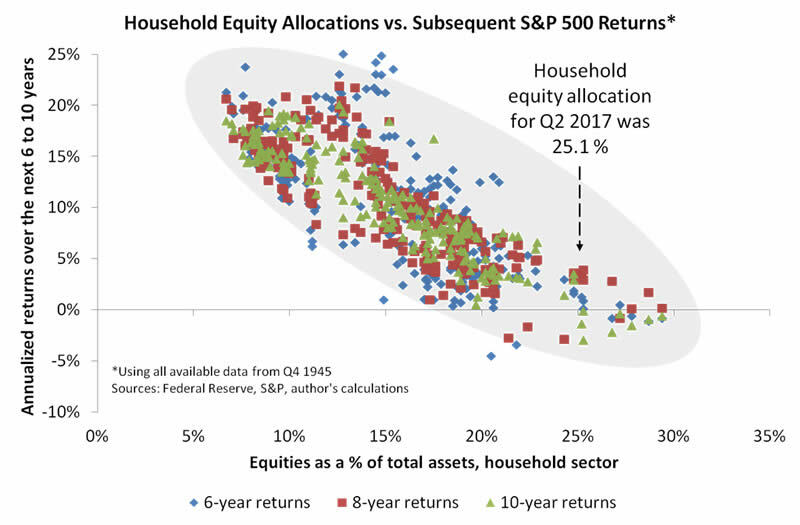 If stocks do, indeed, return 4% over the next six to ten years, that could be higher than the return on any other major asset class, which probably explains how stocks got so expensive in the first place. Second, you might mentally project the scatter plot’s downward trend out to the current equity allocation. Doing that, returns appear to spread evenly around today’s cash rate of about 1%. So, whereas optimistically you might expect a return of 4% or thereabouts, more realistically a negative return is almost as likely. If you stare at the chart long enough, you might see a less bearish picture than in the first scatter plot above. (Stare even longer and you might see the King of France.) But the difference isn’t especially large. On either chart, the downward slope points to a meager long-term return. 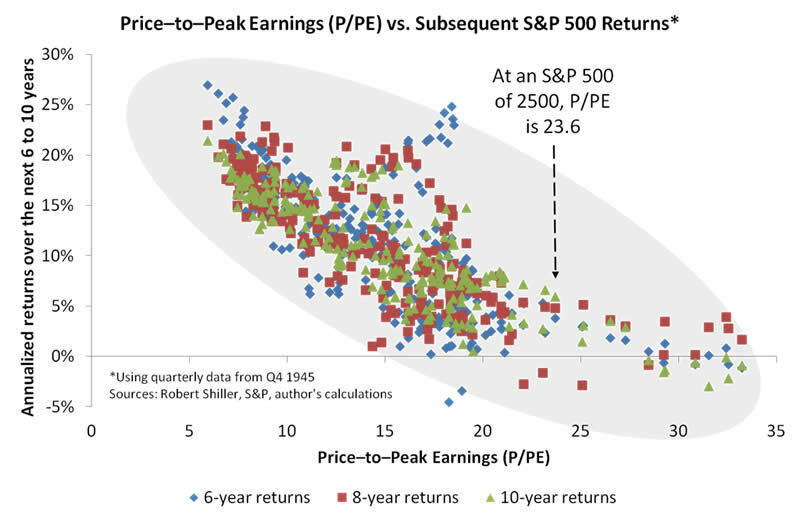 In fact, if we use only the scatter plots above to make our estimate, while also accounting for the Fed’s predicted interest rate path, the S&P 500 appears to offer a similar return to cash. To be clear, we’re encouraging long-term bulls to reconsider their assumptions, but we’re not advising them to dismantle carefully diversified portfolios (meaning those that are spread sensibly among multiple asset classes). We would be more likely to recommend a major portfolio shift if the usual bear-market catalysts—sharply rising inflation, high interest rates and poor credit conditions—were present. More to the point, it seems a good time for investors to check their expectations and risk levels. Investors should develop reasonable expectations informed by data such as those in the scatter plots above. And they shouldn’t take more risk than they’ll be able to tolerate as the next bear market plays out. As always, only a small percentage of investors will accurately time the next market cycle, and we shouldn’t bet too heavily on being among those fortunate few.